This is a fun game that will work as a keepsake gift for bride-to-be. You can put all keepsakes from a bridal shower in a cute box and present to the bride-to-be or make a scrapbook for her. I have made printable cards for this game in three colors. You can choose and print this game in any color that you like most. 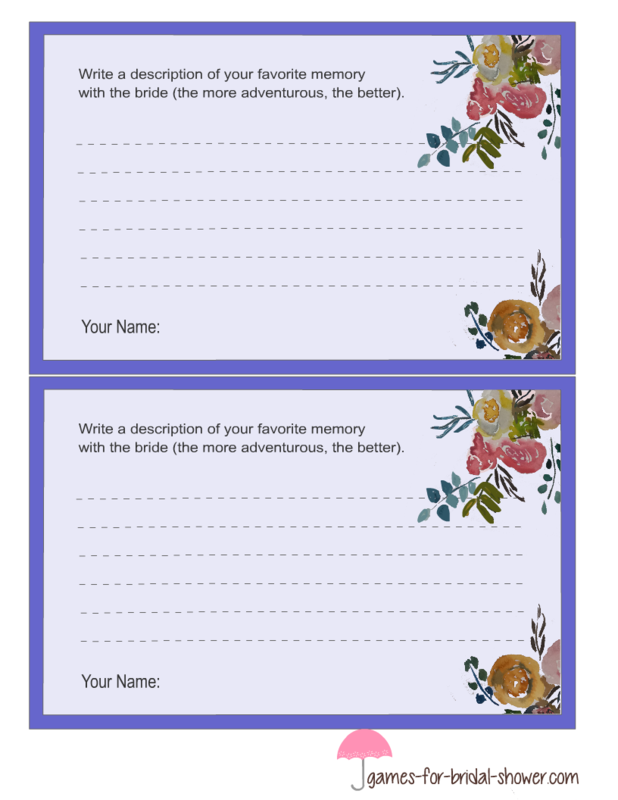 By printing each page, you will get six game cards so print these according to the number of your bridal shower party's guests. How to Play: Distribute these memory cards among your guests along with a pen. Ask them to write their most cherished memory with the bride-to-be. The more adventurous the memory is, the better. Take the cards from all the guests and shuffle and read one by one. The bride-to-be will have to guess who has written that card. These are free printable memory with the bride game cards in brown color. To save these cards, click on the image shared above and then right click on the larger image to save it. You can print this game on ordinary paper or card stock paper. It depends on your choice and budget. 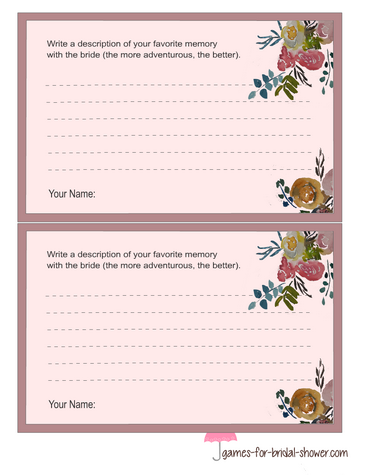 These are game card for 'memory with the bride' game in pink color. These cards are decorate with beautiful image. The bride-to-be would love to keep these cards with her for ever. If purple color matches your bridal shower party theme more, then print these cards with a purple border. If you need some more help with these graphics, feel free to contact me using this form.